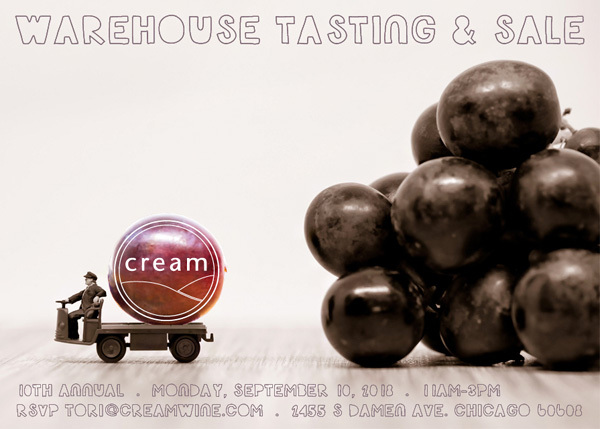 In 2009, we got bored of the typical wine prom and thought, “What if we did a no fuss, zero pretense, end of summer tasting and sale/fall preview at our Pilsen warehouse…a buyer’s tasting…and grilled meat too?” It was a gamble the first year because we worried customers wouldn’t make the trek to Pilsen. But they did. The feedback was quite positive, so we thought we’d host another in 2010, 2011, 2012… Now we can’t believe 2018 will be our 10th Warehouse Tasting & Sale! The event has turned into our biggest, best attended, most successful, and absolutely favorite tasting of the year. And we couldn’t have done it without your support, loyalty, business and willingness to 1) travel to Pilsen, 2) try new and unknown producers from emerging categories and regions. We appreciate the community and love. It is a pleasure to open our warehouse and NEW office doors for libation discovery and pleasure while kicking off another successful fall selling season. This October will mark our 17th year of business. Time to celebrate! PRODUCT: Pallets and tables are placed in the aisles and topped with open bottles for you to self serve, access, rinse and repeat. Discover a thoughtful selection of over 400 wines, spirits, sake, cider and beer—all available for purchase. Explore the many new releases as we’ve been busy curating! This is a fantastic buying opportunity as well as epic beverage experience in general. Buyers are welcome to request anything not already being shown to be opened and shared with attendees. You see it, we’ll pop it. That’s the situation. Those picks will make it to a communal table along with some other goodies should the vibe move us. SALE: Yes, many items will be discounted, and there will be some crazy clearance prices that we urge you to take full advantage of before the busy 4th quarter. Best to come early to get the max for the min so to speak. Help clear out the warehouse, so we can fill it back up! TUNES: The event would not be complete without the talented and local DJ LA Jesus bringing good sound vibes. ORDERS: Our customer service and sales team will be on hand to guide customers, process orders and look up real time inventory as the sale heats up. Any special pricing is available only to those who attend the event. We may extend special pricing on some remaining stock to the rest of the trade, but cannot guarantee supply as many of the insane deals will sell out that day. The Rare Wine Co. & Rosenthal Wine Merchant are two of America’s most respected wine importers. Specializing in European wines, their portfolios include some of the world’s greatest producers. When you find their label on the back, you know you’ve picked a good bottle. Currently, we are one of three distributors in America to work with both portfolios. Wow and what an honor! How we convinced both Blake and John to attend this year, we have no clue! But we’re ecstatic to have these two passionate and knowledgeable professionals to man their respective tables. Iconic producers will be popped. Minds will be blown. Taste buds will be delighted…you get the idea. Zorzal is a young winery making huge waves of grape juice in Argentina! The Michelini brothers (Gerardo, Matias, and Juan Pablo (the winemaker)) and a group of Canadian investors started it in 2007. The winery and vineyards are located in the subregion of the Uco Valley called Gualtallary. You may have heard of Gualtallary as its combination of cold weather and chalky soils is producing some of the best wines—red & white—in Mendoza. People are taking notice! Located at approximately 4,500 feet above sea level, Zorzal is the highest winery in Mendoza. This winery has received great praise since its inception. Other projects by the brothers that we carry include SuperUco, Gen del Alma, and Via Revolucionaria.